New Little Grey Matters Logo! We are thrilled to reveal the new Little Grey Matters logo! Courtesy of Christian Hogue at Lost In Space – the same crew who did Coldplay’s ‘A Rush of Blood to the Head’. Thanks to jamiewrites.blogspot for this image which reminds me of a very similar sculpture that used to sit on my Mum’s shelf. In many parts of the world this week Mother’s Day will rightly celebrate a Mother’s love and dedication to her brood. Given the many, many seen (and unseen!) tasks mothers do, calculating the hours of commitment and slog, and just thinking about the calamities of childbirth, the question does arise: where do Mums get their drive to raise a family? Well, it’s kind of a drug. In fact a mother’s love for her child has an outrageously intoxicating effect on the brain. Maternal love has been found to switch off the parts of the brain involving negative emotions and social judgement (in the right prefrontal cortex – that is, your right forehead area) and also deactivates the parts of your brain that produce fear, angst and aggression (in the amygdala – an almond-shaped structure found in the middle of your brain). Maternal love also been found to switch on the very old, very primal parts of the brain that seek reward and pleasure and that are satisfied by in it the form of pure, straight dopamine – a very happy, “drive”-giving substance that gives exactly the same effects as a drug; pupils dilate, the heart races, and the body lets off streams of anxiety-quashing chemicals from just the hug from an offspring, or even by looking at their photo. Interestingly for women, maternal love activates very similar areas of the brain as romantic love, with the exception of the memory area which activates more when looking at images of your hubby. Also in maternal love, looking at pictures of your child causes your brain area associated with empathy to erupt in activity, (explaining the urge to take care of the infant), whereas in romantic love, empathy activity is caused in relation to touch (that is, women can understand the kind intention behind it). Happy Mothers Day to all the women out there who bring so much happiness and buzz to all their children’s lives. Read this original study here. One of the ‘connection maps’ from the Human Connectome Project, which shows pathways in the brain. I’ll bet you think the brain is an ugly, fairly squishy grey thing that’s best not looked at too closely if you want to keep your dinner down. Not so. 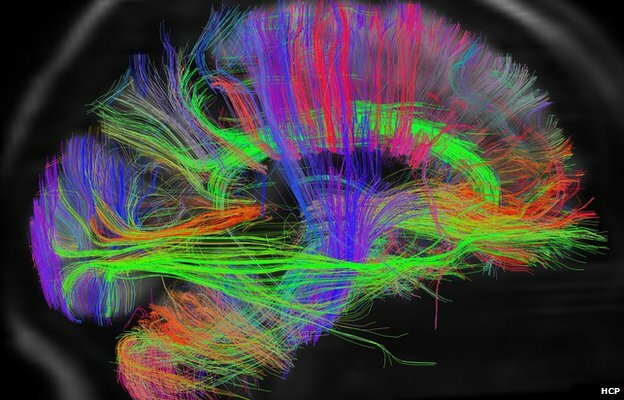 Check out this positively beautiful set of 3D images of the brain released recently thanks to the Human Connectome Project. Using powerful scanners and magnets that could power a nuclear submarine, the US scientists look for tiny particles of water travelling along nerve fibres to trace the major connections within the brain. This exciting tech combines US and European brain research to accelerate our understanding of – and vision into – the brain. 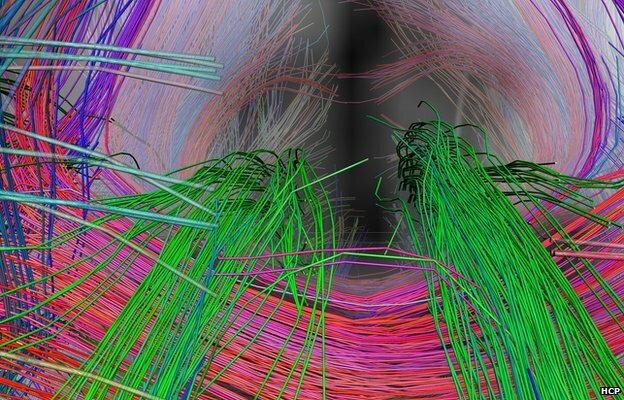 Like the Genome Project, the Human Connectome Project will collect genetic and behavioural data from the subjects in order to build up a complete picture of the factors that influence the human brain and best of all the data will be released to the public and scientists in the coming weeks. 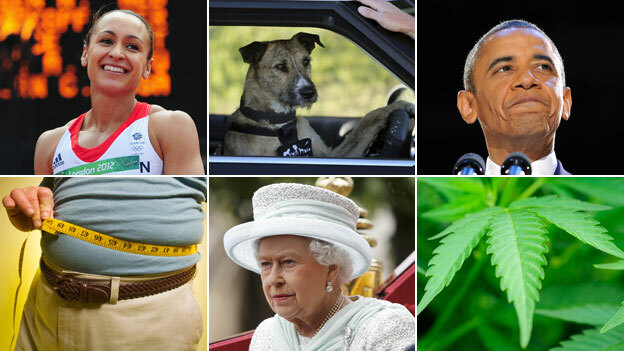 Read more about The Connectome Project at BBC online and The Daily Mail. 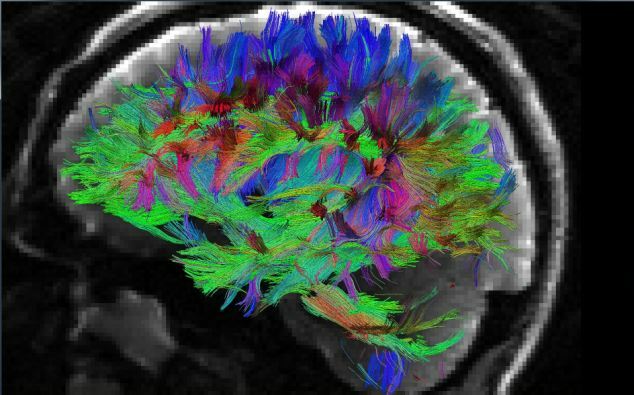 A close-up of the centre of the brain looking back. 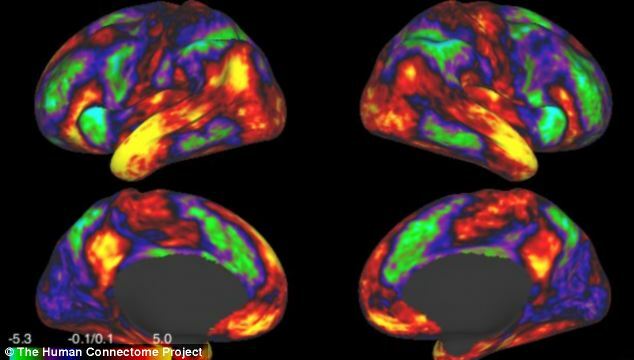 The large green paths are the “cingulum” bundles, which connect areas of the frontal lobes that serve executive function with the memory center, the hippocampus. 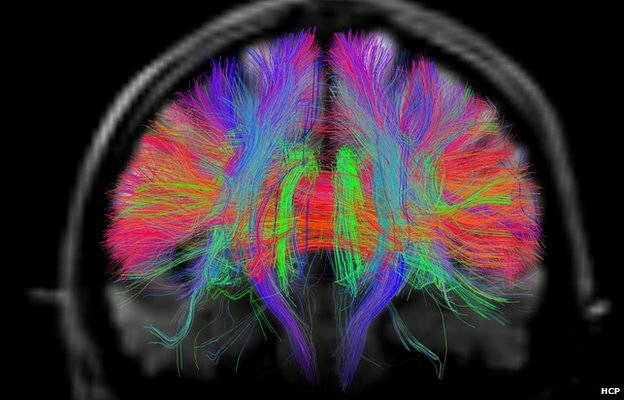 The large red bundle going left to right is the corpus callosum which connects the left and right sides of the brain. 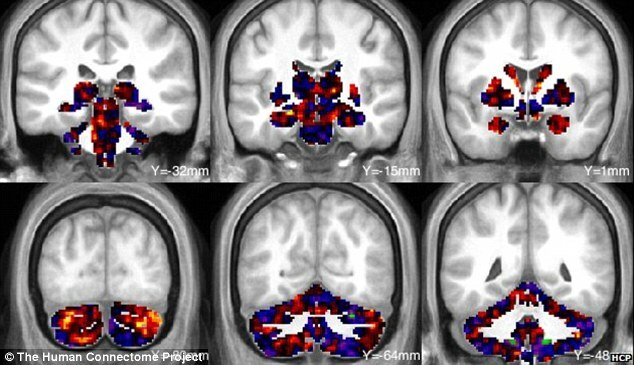 Yellow and red regions show brain activations in the grey matter when subjects view human faces. A complete cross-section through the front of the brain, with cingulum bundles at the centre. 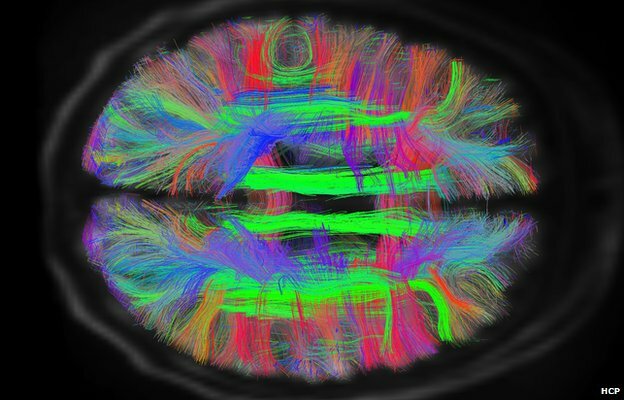 A reduction in the number of fibres in the cingulum bundle which may be an early marker for Alzheimer’s disease. The brain pathways from an above view. The two green paths near centre are the cingulum bundles, and the two C-shaped green paths closer to the sides are major pathways of language, the arcuate bundles which connect the frontal lobes, where facial movements are controlled. The temporal lobes below is where sounds are processed, hearing interpreted, and utterances planned. Side view of brain pathways, from the right. 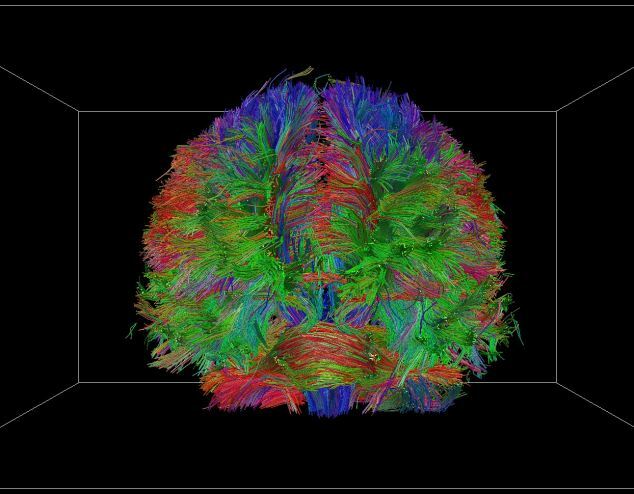 Far left is the visual cortex, connected by a large green bundle which connects to the frontal lobes. At centre, the blue vertical pathways serve voluntary movement, connecting the motor areas of the brain with the spinal cord and muscles. The green path at centre is the right cingulum bundle, here seen from the side. The cerebellum, which controls coordinated movement, can be seen at bottom left.